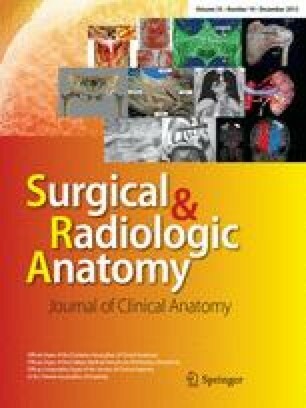 Compression of the ulnar nerve at Guyon’s canal can be caused not only by tumor-like structures, a fibrotic arch, a ganglion, lipoma, aneurysm or thrombosis but also by anomalous hypothenar muscles which are reviewed here. For the search of relevant papers, PubMed and crucial anatomical textbooks were consulted. The abductor digiti minimi is the most variable hypothenar muscle. It can possess one to three muscle bellies. Additional heads can arise from the flexor retinaculum, the palmaris longus tendon, the pronator quadratus tendon or the deep fascia of the palmar side of the forearm. Our own case of an aberrant abductor digiti minimi appearing like connective tissue and originating in the antebrachial fascia is included here. Hematoxylin and eosin staining revealed that macroscopically non-muscle-like tissue contained skeletal muscle tissue. The muscle itself resembled other described cases. In addition, at the flexor digiti minimi accessory heads with origin from the flexor retinaculum, the antebrachial fascia or the long flexor muscles of the forearm can be detected. By contrast, the opponens digiti minimi mostly lacks variations and is sometimes missing. In our opinion, this is due to its hidden location. However, in few cases an additional head can arise from the lower arm aponeurosis. Furthermore, additional (fourth) hypothenar muscles might be expressed. These muscles are characterized by origins in the forearm and insertions on the head of the 5th metacarpal bone or on the 5th proximal phalanx. It must be noted that accessory hypothenar muscles might look like connective tissue at first glance. Often their origin extends to the antebrachial fascia. This can be explained by the phylogenetic fact that all intrinsic muscles of the hand are derived from muscle masses that originated in the forearm. In the opinion of several authors, ulnar nerve compression mostly is evoked by hyper trophied variant hypothenar muscles due to overuse as for example in carpenters. In some rare cases, an aberrant hypothenar muscle can also evoke median nerve compression. We would like to thank Mr. G. Ritschel for the excellent schematic drawing of the accessory hypothenar muscle.